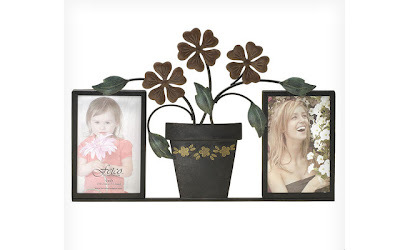 I came across this unique collage photo frame and just had to share about it for a possible Mother's Day gift idea. It's called the Rosanna Flower Pot Wall Collage and is selling on Wayfair.com for $18.00 right now. This metal photo frame hangs on the wall and holds two 4x6 photos. The entire frame measures 10" high and 14.9" wide, so it would be perfect for a small wall space, like over the stove or next to the front door. I love how this wall hanging gives the impression of a shelf without protruding from the wall like a shelf would. It's only 1" deep! Remember that you can get Free Shipping on Wayfair.com when your order totals more than $49!